Priority rules are part of the regulations of some combat sport with weapons. The basic idea is that in the event of a double hit, the fighter who had first started to attack gets the point, and the other gets nothing. Rules like these are used for example in foil fencing, sabre fencing and la canne de combat. They are one of the symbols of sportification for many people. They seem to be an artificial construct that ends up waving away the reality of what factually happened, i.e. both fighters got hit. I certainly did not like that aspect when I used to do foil fencing as a kid. I now understand a bit better why they are there, and what the goal is. It seems that other people in HEMA are growing fond of them. An example near me is the Paris HEMA Open, which uses a ruleset for longsword that includes priority rules very similar to those of sport fencing. This recent post also argues for the introduction of right-of-way in the HEMA context. Although I am much more comfortable with them than I was before, I am still not fully convinced that priority rules are perfectly suited to all forms of HEMA. Here are a few things that I think are worth keeping in mind about them. The source of priority rules seems to have been the wise idea that you have to deal with any attack that you discern. This of course makes sense; as a martial artist you want to remain safe as much as you can, and so being able to recognize attacks and meaningfully react to them is very important. There are edge cases where I could see that you would be better off ignoring defence in life or death situations, specifically when being hopelessly outmatched in terms of skill or athlecism. In that case defending does not lead you anywhere, as sooner or later your defences will fail. However, even in these scenarios you would benefit from recognizing the formation of attacks, so training towards that goal to be an overall good idea even if it does not fully represent the trade off that would exist. In practice, during sparring, the assumption that the fighters should be trying to defend themselves when they notice a danger translates to a convention of always trying to respond to an attack by a meaningful defence. It is an artificial, often implicit rule, that is not there for safety but for realism. It has to be a convention because it only really works if everyone follows it. When only one of the fighters does, the training can become fairly frustrating, just like a one-sided conversation when the person you talk to just keeps rambling regardless of what you say. It is a common problem for beginners, but persists beyond that stage in some people. Also, under the pressure of a competitive setting, that convention is one of the first things to be given up. Therefore the convention needs to be trained in and enforced with clear immediate consequences. A notable effect of not respecting the convention is that there is a higher rate of double hits, although not all double hits are caused by this. One of the rare instances of a double hit in the sources, from the works of Paulus Hector Mair. Did these guys respect the convention? Priority rules are an attempt to enforce this convention in a competitive situation. The idea is to determine which fighter has not respected the convention and penalize him in the event of a double hit, instead of having equal consequences to both fighters. By introducing this asymmetry, you give an incentive to respect the convention, which should lead to cleaner exchanges and better martial artists. At least that is the plan! The net effect of these rules is that when you begin your attack, you have precedence over the action of your opponent, so that only your hit can count. In an ideal world, there is no problem. When someone decides to attack, he gets the priority. When his opponent performs a defence, he takes it back. When someone changes his mind and stops his attack, he loses priority. But you cannot get inside people’s heads like that! You have to rely on external clues to judge the intent of the fighters, and this is where things can get complicated. It will of course be quite hard for a judge to assess whether you have actually seen the signs of an attack, although he can say that you should have. Modern fencing makes arm extension one of the big determinant for right of way. I am sure active sport fencers will correct me on this, but I have memories that the basic is that extending the arm forward gives you priority, retracting it makes you lose it. Beats and parries that push the weapon aside take back priority. This is suited to the light thrusting weapons, but conceivably different weapons would use other criteria. For example, this attack shown in Thibault clearly does not begin with arm extension, although the arms are extended in the end. In la canne, priority is acquired when the strike is chambered and you begin the blow, which is actually with the arm extended to the back! 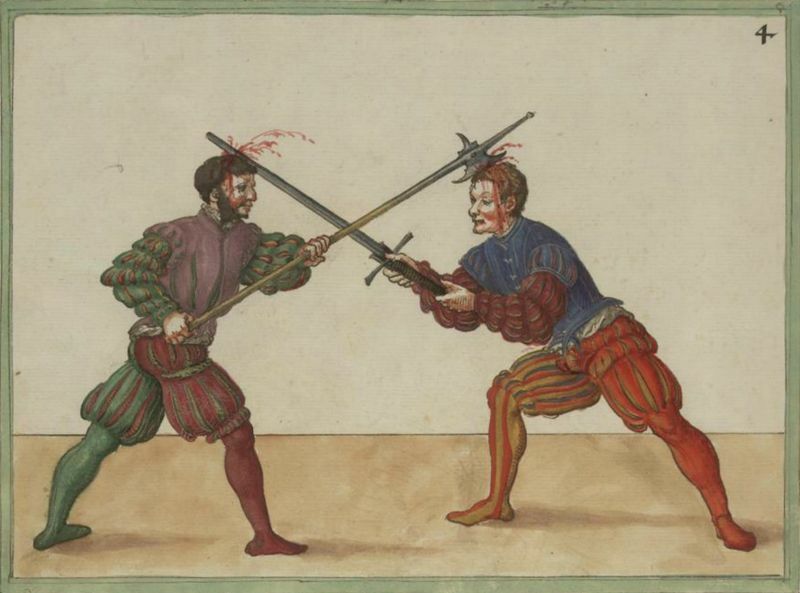 Another example: in modern fencing, if you attack and the opponent attempts to parry, you cannot retract your arm to go to the other side of the parry and attack again without losing priority. You have to maintain forward movement. There are however moves in Bolognese fencing that contain that pumping action; see for example Manciolino’s second offense from Porta di Ferro Larga. Do we want to keep priority in this case? Can we even make a choice that makes sense for all sources? Fabris for one disapproves of the withdrawal of the hand before thrusting. Using priority rules forces you to define “proper” form for attacks, from start to finish, and track this. In arts that are interpreted from written sources, it can be tricky. For rules that are supposed to contribute to the validation of the reconstructed form, this is a bit problematic methodologically speaking, as the choice made in the rules will end up having a heavy influence on the form that will be adopted. This reflexion is never wasted; it is crucial to be more aware of the various way intent to attack can manifest itself for martial artists. But it makes priority rules a bit more difficult to universally implement than it might appear at first glance. Priority rules inherently favour double tempo actions, where you first defend, then riposte in two consecutive motions. They do not forbid single tempo counters, but they make them disproportionately hard to be successful with. This is for a really simple reason. The attack gets the priority at its starts. The defense only gets it back once it is completed. If your action defends and attacks in a single tempo, you never get the priority back before hitting. If the defensive part somehow fails and you get hit while hitting your opponent, he still has the priority, and he gets the point. On the other hand, if you defend first and then attack, even if you get hit you get the point. In effect, the double tempo actions are allowed to partially fail, but the single tempo actions have to be perfect to count. I am guessing this is why priority rules tend to be easily adopted in sports deriving from martial arts that have a distinct preference for double tempo actions (la canne de combat is the perfect example here, containing only double tempo actions). In some sources that preference is not apparent. It could be argued that it is because single-tempo actions are more advanced and needed to be described more thoroughly. Whatever the reason, if you want to train single tempo counters, common priority rules are a poor context as failures are systematically punished. In theory it could be rectified. You could identify the start of single tempo counters and switch priority at that time. In practice, I am not so sure it is possible. Right of way is already quite hard to judge in the blink of an eye in the common forms, and the formal difference between a proper single tempo counter that fails and a plain blind counter-attack can be tiny. Since right of way protects you when you start the attack, you do not learn to abort it if you see a danger. Under the convention, you should! This creates overconfident attackers, who will switch to full-on attack mode as soon as they have started before the opponent, disregarding their own safety in the process. That form of tunnel vision is something that should be avoided, but the rules themselves do nothing about it. In fact the only incentive to abort an attack is the possibility that your assesment of priority is not the same as that of the referee. In some cases, you are intentionally causing a double hit to punish your opponent for not respecting priority, which is not something you would do with life and limb on the line. That explains why using priority rules generally does not curb the rate of double hits down. It is possible to build more and more complex and quicker attacks that will confuse the opponent and perhaps cause a double, but this is no problem as long as the referee sees your priority. People end up fighting for priority, being the first to attack, instead of fighting to be the first to hit, but the end result is the same: with the offensive bonus you create double hits. Supposedly, training with right of way would still make you safer in a real fight, because you have learned to recognize signs of attacks. You just wouldn’t respond in the exact same way. But you have to remain aware of that throughout the whole training. Because priority is judged from the outside, it is up to you to make your best effort to fully respect the convention even when you have priority. I think other rulesets are still needed which look primarily at what happened and are, as much as possible, form-neutral, to serve as testing and common grounds for many styles. These should also carry the same consequences for being hit whether you were going for a double or single tempo response. Many HEMA rulesets are in this category still, and I think for good reasons. Priority rules can be a very good tool in a club environment, where you already have an enforced form, as long as you are fine with the strong double tempo bias.